As a locally owned business, Great Atlantic Hot Tubs, Pools & Saunas is committed to supporting the communities in which we operate. You’ll find our owners Rich and Eileen Werber and the Great Atlantic team involved in a number of local organizations – from leadership roles in civic and community organizations to our sponsorship of local organizations. 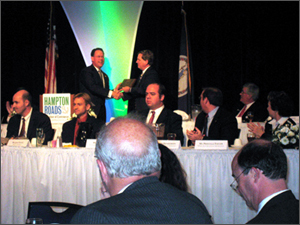 Rich Werber’s involvement in the Hampton Roads Chamber of Commerce included serving as the Chairman of the Board of Leadership Hampton Roads. He was named the “Outstanding Volunteer of the Year” by the Hampton Roads Chamber of Commerce for his tenure as treasurer of the organization. And, as a board member of the Future of Hampton Roads organization, Rich has supported their many activities over the years. In 1999, Eileen was one of three women who established the local Tidewater Affiliate of Susan G. Komen for the Cure. Initially, she managed the Affiliate with Great Atlantic’s resources to support the organization’s efforts to increase awareness of breast cancer as a life threatening disease. In addition to other honors, in 2008 Eileen was awarded the “Pink Ribbon Lifetime Volunteer Award” in recognition of her contributions to the Affiliate. With the Affiliate’s growth and success came its own office and staff. And, while Eileen no longer manages the Affiliate, she, Rich and the Great Atlantic team continue to support the organization. Over the years Great Atlantic has also been proud to sponsor a number of local programs and events, including the Old Dominion University Men and Women’s Basketball teams, the Marine Corps Toys for Tots program, the Town Center Kiwanis Charity Golf Tournament and the Komen Tidewater Race for the Cure®. Finally, with both owners having been military dependents, Great Atlantic has looked for ways to support the military community in Hampton Roads. That includes special offers for our military, our military spa care deployment program and our most recent partnership with the Navy and Coast Guard exchanges. So, what does all of this mean to you, our customer? When you do business with Great Atlantic, you can be assured that you are doing business with a company whose owners have a long standing vested interest in and a commitment to our community. Great Atlantic Hot Tubs, Pools & Saunas is proud to partner with the Navy Exchanges and the Coast Guard. Exchanges to bring our relaxation products to the military and Defense Department community throughout our service area. All military (both active duty and retired) and Defense Department Personnel that have exchange privileges can purchase a Great Atlantic Hot Tub, Sauna, Swim Spa or Fiberglass Pool directly through the Navy Exchange (NEX) or the Coast Guard Exchange (CGX) in southeastern Virginia and northeastern North Carolina. 1. Visit any one of the Great Atlantic store locations and work with one of our Wellness Associates to make your product selection. 2. Take your sales order invoice to any NEX or CGX exchange location. At CGX, go to the Special Services department. 3. Give the Exchange Associate your Great Atlantic sales order and they will process your purchase and collect your payment. In addition to the military STAR card, you may use any normal form of payment that you would typically use for exchange purchases. Great Atlantic also maintains product Kiosks at each of the exchange store locations with display monitors and brochure information on all of our products.